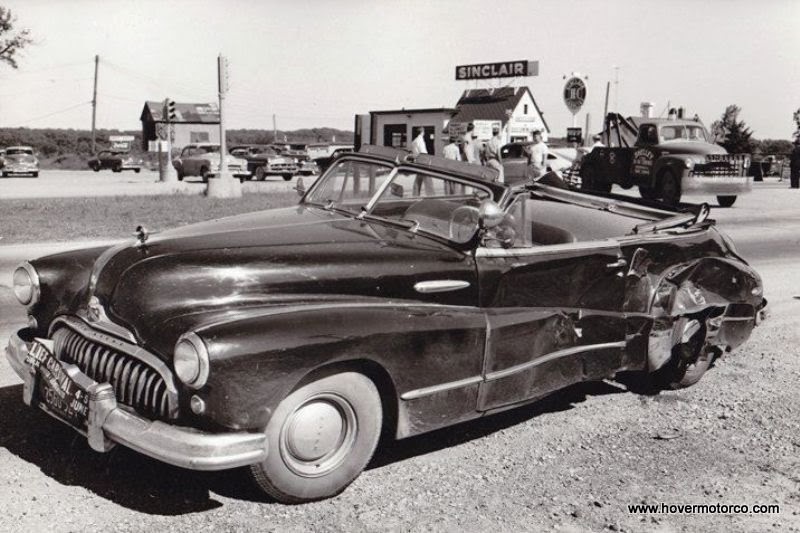 Today, this ’48 Buick convertible would be a pretty special car, but when it got the left door and quarter panel clobbered it didn’t look like it was getting the best of care. The car appears to be all black with black tires. If you saw it today, there’s about a 90-percent chance that someone would have added wide whitewalls. I like that spotlight, too. Luckily, this happened really close to the Sinclair station, so the tow bill shouldn’t be too high. 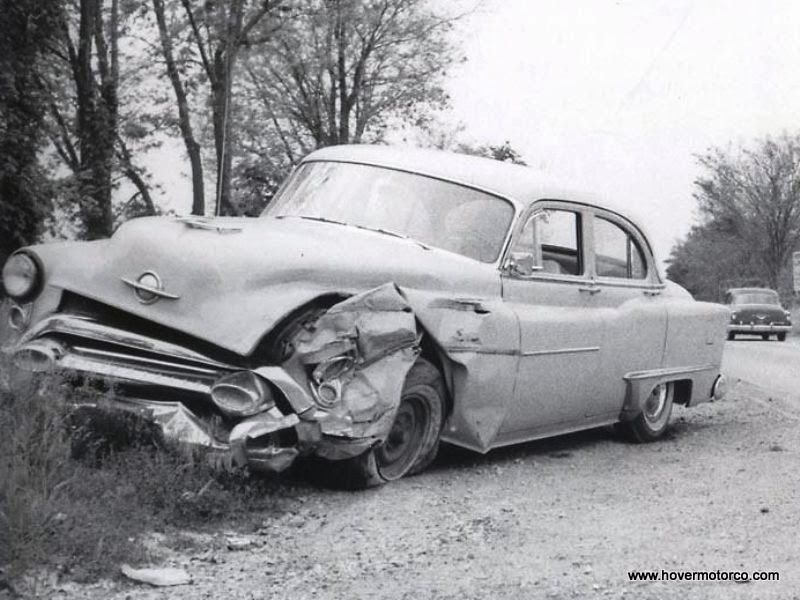 I’d take that car now even with the damage. It doesn’t look too bad, and it sure would be cool once you got it back together. Heck, I might even leave the whitewalls off. 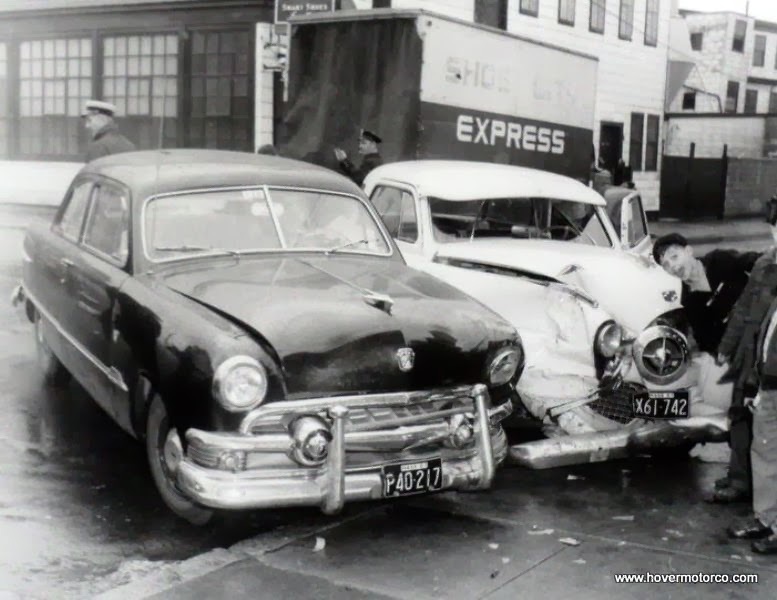 Here’s a little dustup between a ’51 Ford and a ’50 Studebaker Starlight Coupe. The bullet-nosed Studebaker was a really bold design when it was new, while the Ford was at the end of the shoebox era. The Ford is really conservative, with black tires, little hubcaps, and little else. h The antenna would indicate that it had a radio, though. The Stude was pretty flashy anyway, but sun must not have been a factor here because that accessory sun visor didn’t prevent this crash. My favorite part about this picture is the kid photo-bombing it from the east. 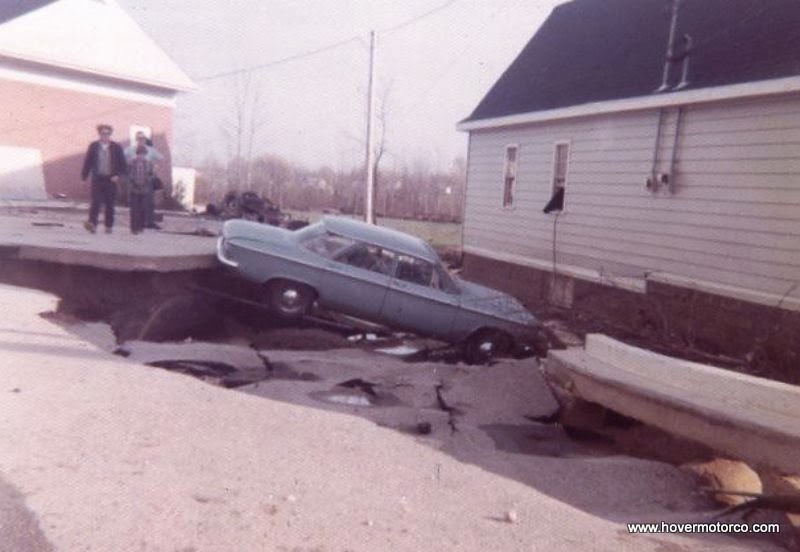 I’ve told people before that one of my fantasies is to accidentally drive into a sinkhole that opens up before me. Then, the traffic helicopter will take pictures of the police and me looking down in the hole at my destroyed car, the footage will get picked up by CNN, and people will be able to see me on the news feed at the airport. It’s the little things that keep me going. It looks like the owner of this ’60 Corvair is living the dream, as the earth appears to be claiming it. I guess this could have been earthquake damage too. Whatever happened, it’s a glorious was for a car to die. There’s hardly a ’49 Mercury in existence that someone didn’t modify this front end a bit. Usually they were subjected to shaved emblems, Desoto, Pontiac, or other grille treatment, and some other kind of bumper. In this case, they simply smashed this convertible into something, changing the look instantly. Who knows, this may have been a good candidate to customize after this. I wasn’t even alive when these pictures were taken, so I obviously didn’t take them. Most of them are for sale on eBay, so if you think you’d like to own the originals, go search around there. I just thought they’d make an interesting slideshow, which you can see below. Or, click this link for a nicer version. And remember, speed kills. 55 to stay alive. 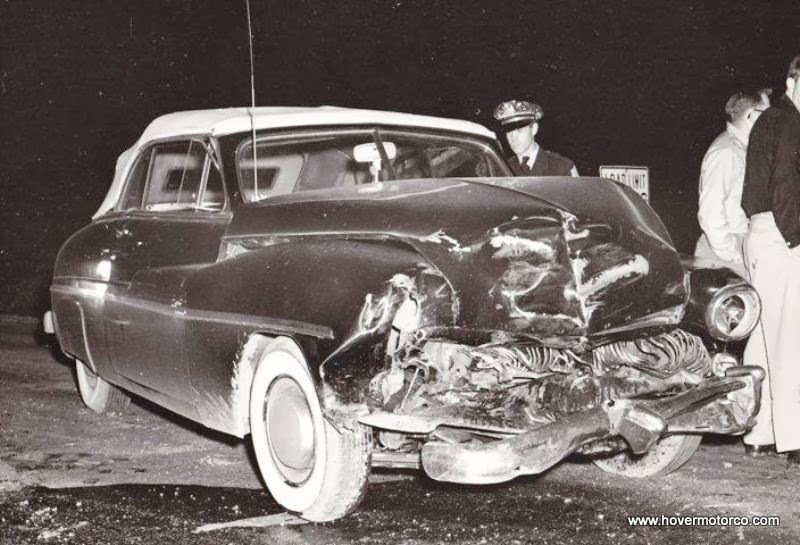 I bought a book called "Old Car Wrecks 1920's to 1960's" by Ron Kowalke. It was in the discount section at B&N for $7.00. It had some neat pics of ambulance wrecks and fleets from the 30's involving Kansas City Mo Health Department. 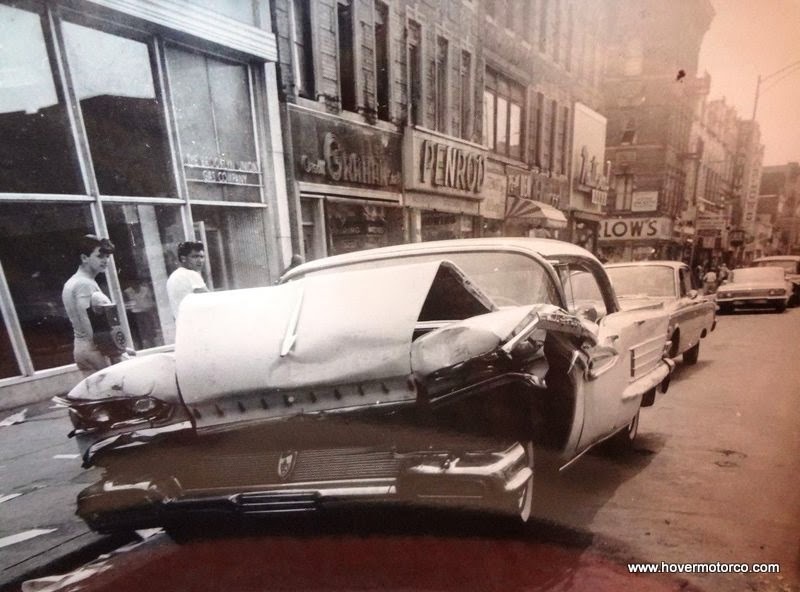 Can't tell where pics were taken but must have been the 30's version of KCFD ambulance system. These are neat books. Thanks for website. I have that book! It's pretty entertaining.